Because Sharing is Caring, and I LOVE sharing things that have elevated my personal health, I hope you check these out for yourself. Highly conscious, caring, and downright amazing, I’m sure you will love these products and the people who create them as much as I do. As with diet and therapies, there isn’t a one size fits all. So as always, I encourage you to explore and experiment. If you’re life is touched in positive ways by these products, please share these with friends and family as well. Living Libations signature Seabuckthorn Best Skin Ever is the foundation creation for radiant skin. This body and face product is “all-in-one” for cleansing, exfoliating and moisturizing. Of all the Best Skin Evers, this one and Rose Best Skin Ever are the best choices for the face and can also be used on the body. Seabuckthorn Best Skin Ever is the ultimate choice for brilliantly cleansing, moisturizing and toning the skin. All Pure Organic and/or Wild crafted Ingredients: super-critical Sea buckthorn oil, golden jojoba oil, virgin coconut oil, tamanu oil, lavender, vetiver, grapefruit, and palmarosa essential oils. Click Here for Your ‘Best Skin Ever’! 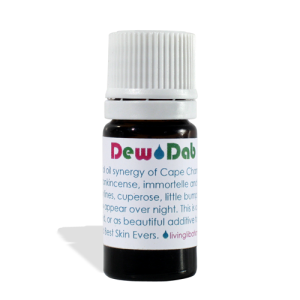 Dew*Dab is the go-to spot treatment for your skin: a potent serum for tiny lines, cuperose, little bumps, scars, discolorations and blemishes. One drop at a time, it may be used undiluted, placed neat (directly) on intended areas, or may also be combined with a squirt of RoseGlow Serum, Seabuckthorn or Rose Best Skin Evers, and/or Soothsayer Serum. Pure, Organic and/or Wild crafted Ingredients: Undiluted Essential Oils of Cape Chamomile, Rose Otto, Cypress, Frankincense, Immortelle and Lavender.